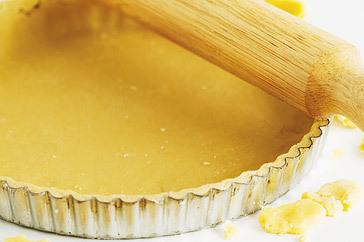 This Sweet Shortcrust Pastry is the one my mother always swore by, and used to make all of the wonderful tarts and flans that I sampled as a young child. She has passed it on to me, and this is my pastry base of choice for desserts. Rub butter (shortening) through the flour with the tips of fingers. Mix into a dry dough. Mix the egg yolk and milk together, and add to the dough. Mix together, kneading on a floured board. Dough should be smooth and all ingredients totally blended together.